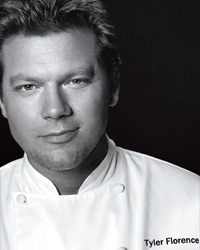 Superchef, TV star and prolific cookbook author Tyler Florence tells F&W about his top Bay Area destinations, his go-to entertaining dish and his famous California-fried chicken. What are your favorite food gifts? We love to give out small jars of our own honey. We have 3,000 Italian honeybees in our backyard, which produce a clear, golden honey that smells like the air around Mount Tam, with wildflowers and wild fennel. We package it in small 6-ounce jars that we label with the name of the recipient. Hopefully, it will take them a few months to work their way through the jar, so any morning they pop a piece of toast into the toaster and spread on some honey, they can remember it’s something you made for them. I also like to give personalized Moleskine notebooks to my chefs and managers, with their names embossed on them. As a chef I don’t leave the house unless I have my Moleskine, because when an idea hits you, you can either record it there on the spot or it drifts off to the land of nevermore. Writing in a Moleskine also feels more organic than tapping in notes into a computer. You can also judge the idea by your handwriting—if it’s fluid and full of creativity, or stressed and tight. It’s important to feel calm and relaxed when people get there. When you plan a menu that’s too large or too aggressive, nobody walks out with anything fantastic. It’s much better to make something clean and simple and delicious and let that be it. A standing rib roast is impressive, it looks like a big feast when you bring it out, and it provides something for everybody temperature-wise. You can also tell a story about the beef and where it came from, we have so many choices now. Just put sea salt, peppercorns, garlic, rosemary, sage and thyme in a mortar and pestle or a food processor, pulse it to a paste and slather it on the meat. Throw it in the oven at about 325°. It will take the better part of four hours to cook, depending on its size. You can throw potatoes and mushrooms in the bottom of the pan to cook in the drippings, so you have a side dish ready to go along with it. Or you can deglaze the pan with some wine for a sauce. But it’s one of those things that, once you get it into the oven, the oven does the hard part. You can use the oven as your sous-chef. What are your top don’t-miss places on a trip to the Bay Area? My wife, Tolan, and I love Stinson Beach; it’s a sleepy little town about 45 minutes north of the Golden Gate Bridge, and it’s the coastal center of Marin County. It’s a six-mile-long beach, populated by no more than about 1,000 people year-round. We spent a week there and it was magic. Because we have small kids, we’re into instant gratification when it comes to vacations, because hopping on a plane with them can be a bit of a challenge. I love to drive Highway 1 along the coast. I’m a motorcycle enthusiast, so I’ve got a 2010 Triumph Bonneville Racer that we stripped down and turned into a kind of Frankenbike. It looks like a 1960s café racer, it’s beautiful, I love my bike. It’s just magnificent to be able to unplug and go on a drive up the old Highway 1 along the coast. It’s some of the most beautiful coastline in the world. We go on family hikes in Marin. During the rainy season, waterfalls pop up around Mill Valley—Cascade Falls is spectacular, and right in our backyard. South of us, the Ritz-Carlton, Half Moon Bay, makes for a fantastic getaway, it’s so close. It’s better for couples than families with little kids. But you can throw a bag in the car and hire a babysitter and get away for a weekend. At Wayfare Tavern, it’s without question our fried chicken. We use Mary’s organic chicken from Petaluma, break them down into breasts and legs and wings, and Cryovac them separately with roasted garlic, California olive oil, sage, rosemary and thyme. Then we sous vide them separately—the legs in one batch, the breasts in another—because each piece has a different ideal cooking time. Then we plunge the bags in ice water, and let them rest overnight. The next day we cut the bags open and put the chicken into a buttermilk wash seasoned with hot sauce and salt. Then we dip the chicken in my grandmother’s flour mixture of flour heavily seasoned with garlic powder, onion powder and salt and pepper. Last, we fry the chicken in oil that we season with herbs. (Before we fry the chicken we add fresh sage, rosemary and thyme sprigs to the Fryolator, and serve the crispy herbs as a garnish along with a wedge of lemon.) The chicken comes out super crispy on the outside and incredibly soft on the inside. It’s not Southern fried, it’s California fried. It’s turned out to be this defining dish in the restaurant, and I’m very proud of it. I graduated from culinary school in the early ’90s, and moved to New York during the first big wave of celebrity chefs: Charlie Palmer, Emeril Lagasse, Charlie Trotter, Jean-Louis Palladin; Mark Miller’s Coyote Café book, all of their cookbooks, I just consumed and slept with them under my pillow hoping through osmosis I would extract more out of them. But then there are books I love because they’re such oddities, like The Opera of Bartolomeo Scappi; Scappi was arguably the world’s first celebrity chef. He cooked for the Pope, and wrote his book in 1540, with small drawings of bizarre kitchen tools, and recipes for strange things like door mice. Seriously: They would keep mice in small cages and feed them figs soaked in wine, then roast them or fry them whole. It’s just bizarre! But it’s also beautiful. It shows you we do have a pretty antiseptic idea these days of what’s edible and what’s not edible. I’m a big fan of René Redzepi’s Noma book. I’ve seen so many culinary trends come and go, and it’s nice to see something like the naturalism that’s happening now, this new interest in foraged foods, where the excitement is not so much about the wizardry of cooking but the flavors of foods you’d otherwise walk right by—like wood sorrel, or Douglas fir shoots. The idea that you could pick those in the spring and lightly steam them to give a dish this wild flavor that you might smell in a shampoo but never think about eating, I think that’s marvelous. All my guys right now are into foraging—they’ll take an afternoon or morning and fill some deli containers with whatever they find, to bring in and add to a dish. I think that’s so great—keep your eyes open, there’s a lot more out there edible than you might think. What’s one technique or dish everyone should know? How to make a classic Bolognese sauce. It’s got such an incredible texture and flavor—the combination of red wine, tomato and milk, porcini and pancetta, with beef for flavor, veal for texture and pork for fat, then the sage nuance, the stick of cinnamon—if you can master all that, it’s always a hit.